There’s no better time and place than January in Minnesota to read inspirational/aspirational landscaping books. My overall impression of this book was similar to my overall impression of most gardening books: first, much of the book assumes you have at least an acre to work with, unlimited money, and live in a hardiness zone of at least 5. So, as usual much of the information is useless to a middle class Minnesotan in the inner city. Williams also has little interest in native plants, and relegates edibles to a kitchen garden—but oh, her kitchen garden examples were beautiful. I was able to glean some nuggets of good advice in this book, despite its shortcomings. The first concept that got me thinking was identifying separate rooms in your garden. I haven’t really thought about my gardens this way. I tend to identify them more by guilds, in the permaculture tradition—my herb spiral, my cherry tree garden, my Viburnum garden, my Serviceberry garden, etc. But it’s a useful exercise to think about how these gardens relate to each other within their larger contexts. The idea of having a room helps you to think about the different features of that room, like designing your living room. You’ve got to have walls, a ceiling, a floor, something to sit on, and sources of light. Williams advocates dividing up your yard into distinct rooms—some of those rooms could be wide open spaces. The rooms could be large and formal or small and intimate—from a small bench under a cherry tree to a museum-like room with columnar trees or shrubs. Her chapter on designing an effective terrace was funny; she described suburban homes with their elevated decks and no trees or walls as being on a stage, with your neighbors as the audience. I’ve felt this way about our deck since we moved into this house almost nine years ago. It’s not that I dislike my neighbors, but I’d like to be able to sit out on the deck with a glass of wine and have some privacy. I’m ahead of the game on this one since we added our arbor two years ago, and plants in 2015. As they fill in we should start to get some privacy on our deck—hopefully starting this year. The bones are there. Now the grapevines and hops just need to hurry up and grow to fill in the walls and ceiling. And the scale was right on this one too. The back of our house is this big white wall. The arbor needed to be big in order to soften it and tie it together effectively with the rest of the yard. 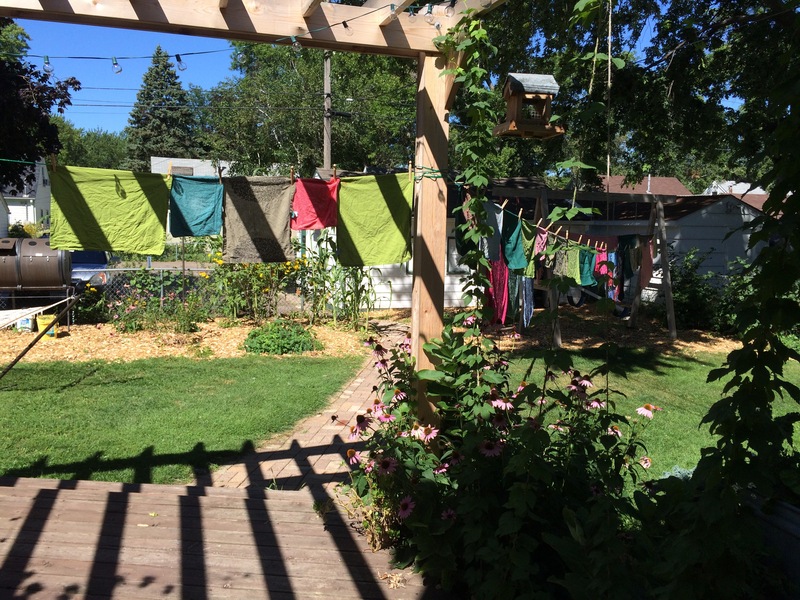 Of course, my practical side means the arbor also supports temporary clotheslines during the summer. And that’s the big difference between Bunny Williams and me: her garden designs are pure aesthetics. I am trying to stack functions (in the permaculture sense) on every single element I add to my yard—and I’m going to be writing a lot more about that this year. My landscape needs to be much, much more than pretty. Another concept of hers that spoke to me was the idea of including surprises in your garden. For example, if you have a meandering path, plant something tall at a curve so that garden visitors will get the anticipation of wondering what’s on the other side. Hide and reveal. She’s also fond of adding little windows in walls, and carefully placing ornaments such as bird baths. This is another thing I have not really thought much about. If you’re standing in my front yard, you can see the entire front yard garden. Same with the back yard. I’m going to be thinking about this as I look at my gardens this year. 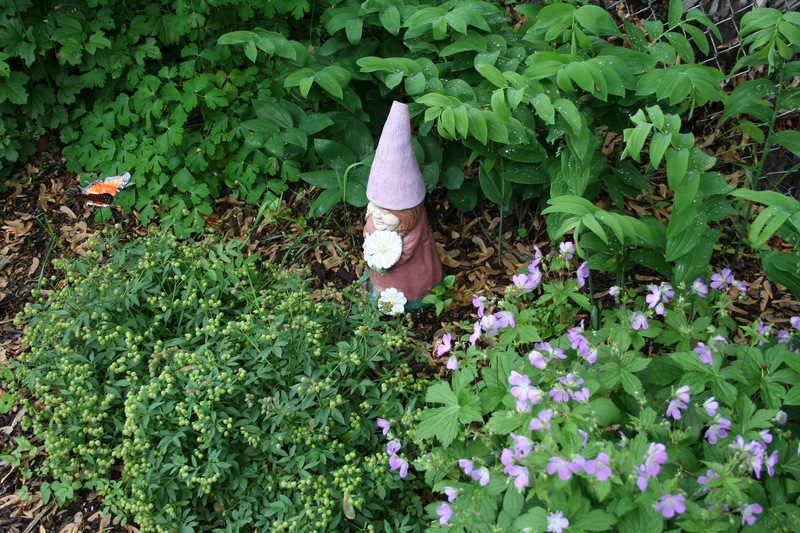 I added this rescue gnome last year; she’d been under a bench at the office for a couple years, where everyone thought she looked scary. I swear she instantly looked happier when placed in the garden. Another thing I’m thinking about this year, thanks to this book, is passages between rooms. I want to think about how people move between the front and back yards. It’s not always pleasant when the raspberries on the north side reach their peak and you have to swat aside huge canes! Williams advocates adding gates, pergolas, and/or arbors to indicate passage between rooms and to help frame the first view of a new garden room. 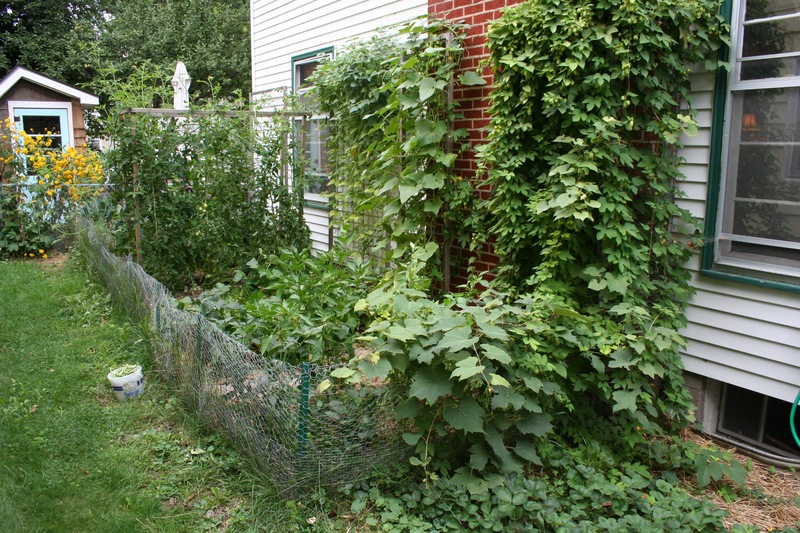 I may add an arch in my strawberry garden (pictured below, bottom right), as an entrance to the vegetable garden area. It would draw the eye away from the uglier aspects of my neighbor’s siding (just to the left of the picture below) while also providing support for a grapevine that I clearly planted in the wrong place. It currently grows on the low rabbit fence surrounding the garden and is generally unruly. The hops (right trellis) have already been removed but an arbor at the corner near the bottom left of this picture might just be what we need, here. The book also touches on plants, of course. Up until very recently most of my garden designing was done with plant material. This part of the book touched on things I’ve already been thinking about such as layering your landscape—groundcover, perennial, shrub, understory trees, canopy trees. Unifying different areas by repeating colors and textures is a good thing. Purple coneflowers have become a unifying feature in my garden. They can be found in every garden bed. This is for a simple reason: they re-seed. Every spring I get free new coneflower seedlings to move about to any open spot I can find. It’s a very economical unifying design feature. Messy? Maybe a little bit. I don’t have any large-scale turf removal and garden installation planned for this year, so I’m going to try to focus on editing. A couple of the plants in my boulevard, in particular, are too big for that area. So they’ll be moved or removed altogether. 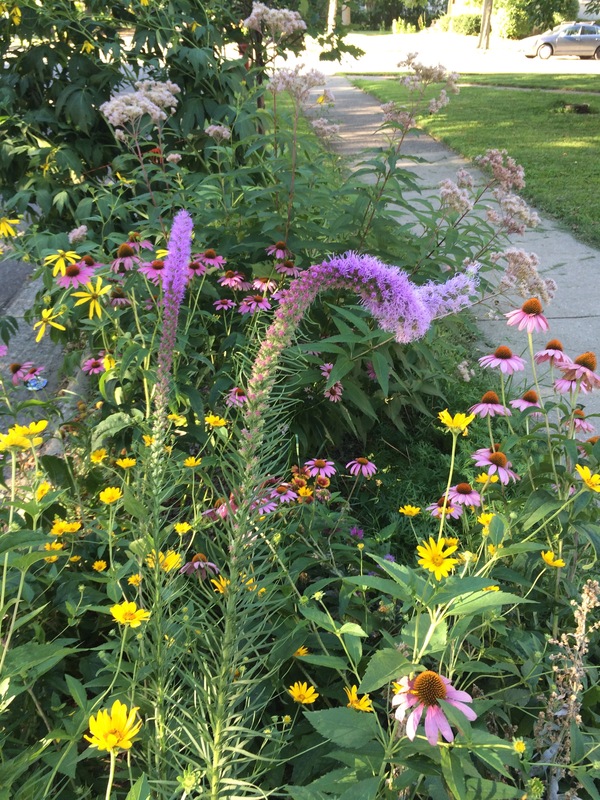 See the purple coneflowers? They really tie this room together. If you’re interested in landscape design, definitely check books like this one out of the library. Don’t waste money buying them, though. The pictures cheered up my January, and got me making plans for this year. And that’s really what this is all about, right? We’re making progress every year. Categories: Gardening, Permaculture, Practical | Tags: book reviews, edible landscaping, landscaping, Permaculture | Permalink.